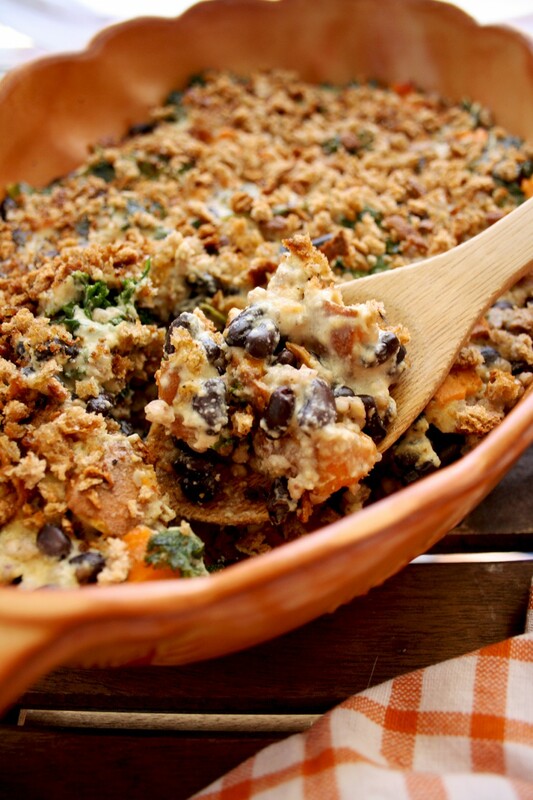 Comforting gluten-free and vegan sweet potato casserole with black beans, kale, buckwheat and roasted garlic sauce. 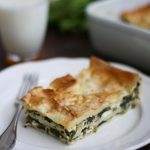 Easy to assemble and perfect to make ahead. 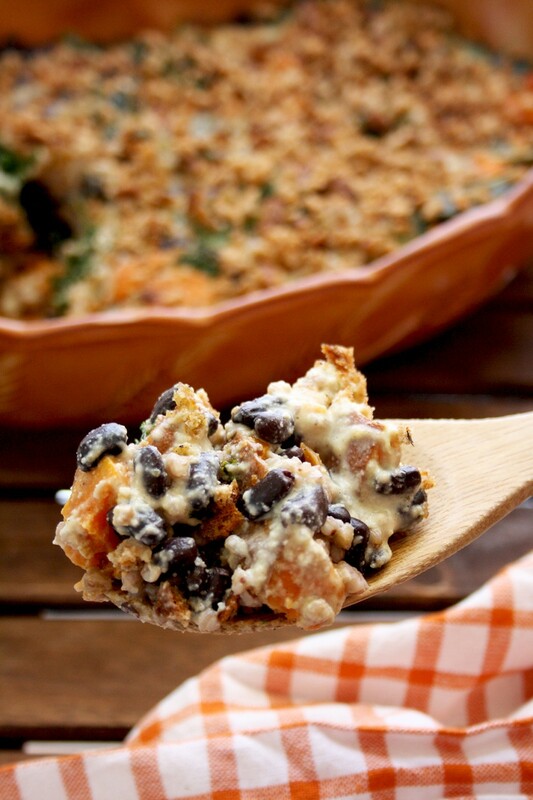 I’m sharing a recipe of this comforting sweet potato casserole with black beans, kale and buckwheat today. 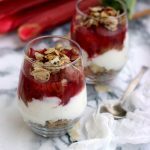 It’s the last day of winter but I’m still in need of comforting and rewarming food, which is also easy to throw together. 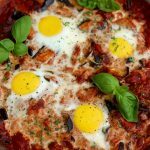 In my free e-book “How to Cook without a Recipe” I share principles of creating a meal from scratch and I describe some examples of healthy meals you can create based on these principles. 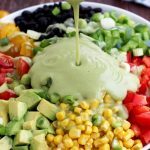 In this post I will show you another example of a healthy and satisfying meal with a perfect flavor profile. 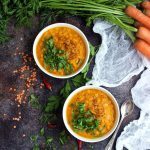 Basically, you can feel free to substitute any other grains for buckwheat (like quinoa, rice, barley, millet) and also take any other kind of beans, root vegetables or pumpkin, chewy greens and creamy sauces. It gives you a lot of room for improvisation. 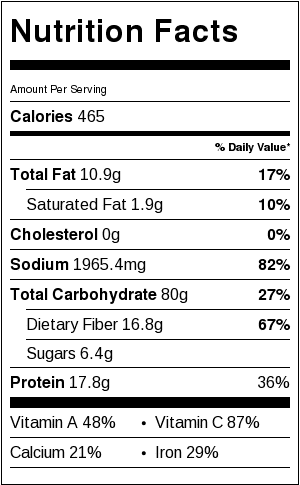 To make a perfect flavor profile, make sure to include a variety of tastes (sweet, salty, bitter, sour, umami pungent, astringent) and textures (crispy, chewy, creamy). One food can have multiple tastes, so there is no need to use a lot of ingredients. You can always balance the missing tastes by adding spices. 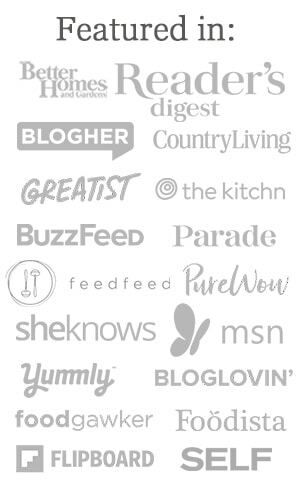 I provide examples for each type of taste in my free e-book book, so I recommend you to download it if you are interested in cooking. It’s a great source of inspiration for home cooks, especially for those who convert to vegetarian or vegan diet. 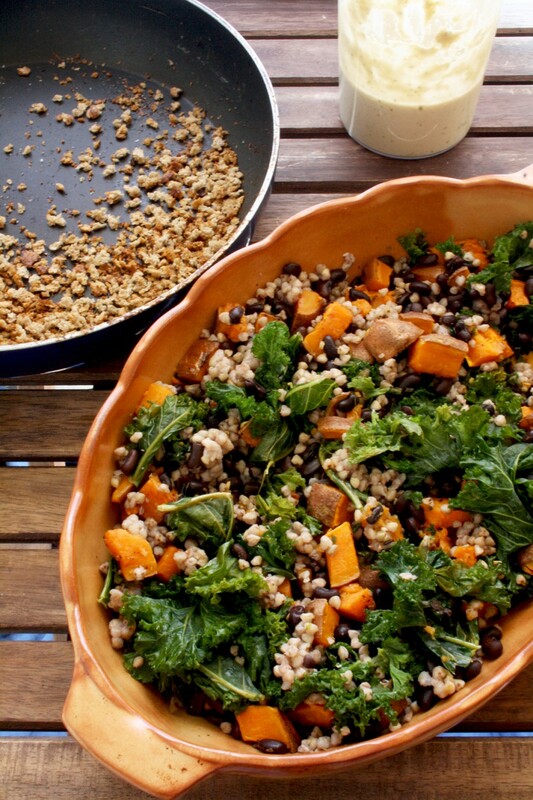 This exact casserole consists of buckwheat and sweet potatoes as a sweet base, kale as a bitter base, black beans as an astringent base, whereas the rest of the tastes are compensated by the roasted garlic sauce. 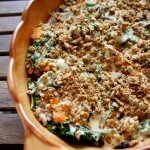 Creamy sauce, chewy kale, sweet potatoes and beans and crunchy breadcrumb topping create a perfect balance of textures. 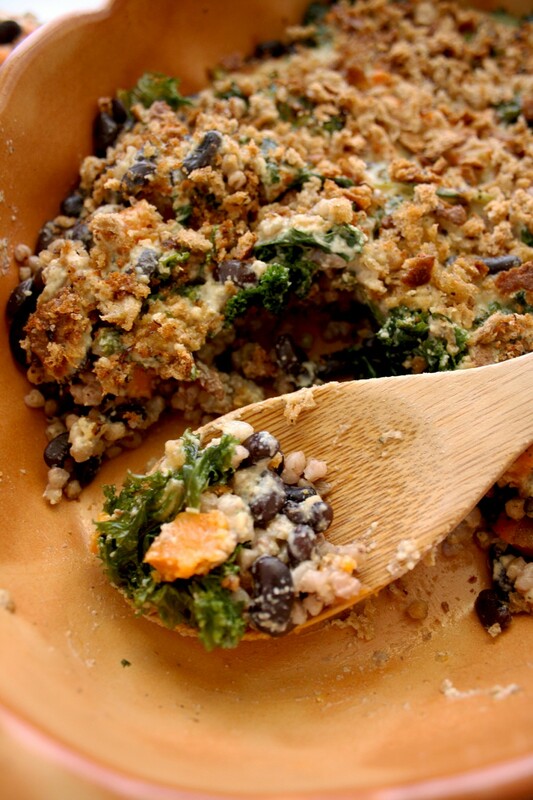 The best thing about this casserole is that you can prepare all the ingredients ahead. 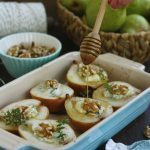 Roast your sweet potatoes or other veggies, boil beans and buckwheat or any other grains, make a dressing and create a variety of dishes throughout the week spending minimum amount of time and adding a few ingredients you have on hand. 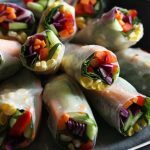 You can make salads, soups, casseroles, stir-fries, chilies, tacos, curries! Just plan ahead and buy some items for your pantry like canned tomatoes, coconut milk, beans, broth, tortillas or whatever you like to use. 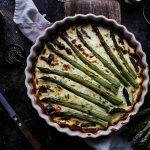 I usually keep a lot of seasonal veggies in my fridge and try to incorporate them first before they go bad. 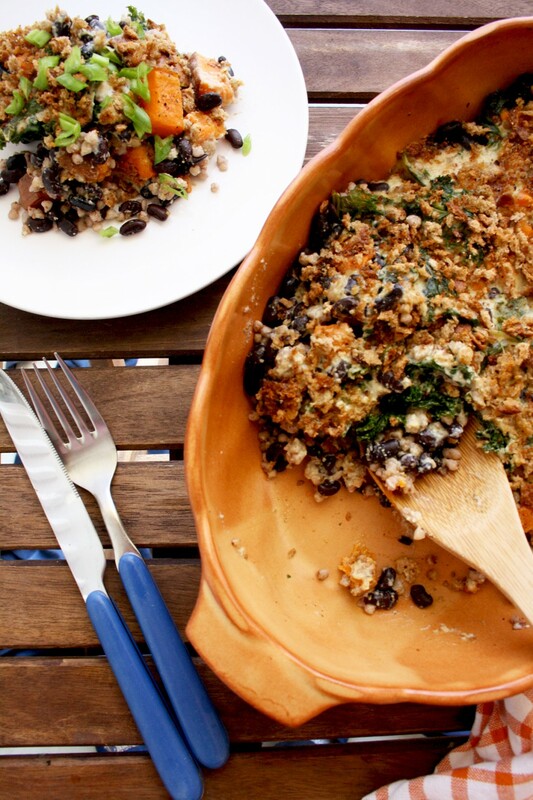 See the recipe for this sweet potato casserole with black beans, kale and buckwheat below! Preheat the oven to 180 ºC or 350 ºF. Dice the sweet potato and transfer to a baking dish or tray. Sprinkle with olive oil, salt and pepper. Put sage sprigs on top. Roast for 25 minutes. Meanwhile, rinse and drain the buckwheat. Put it in a saucepan and add water and 1/2 teaspoon salt. Bring to a boil over medium heat, then cover and simmer for 18 minutes. Make the bread crumbs: heat a lug of olive oil in the skillet or frying pan over medium-high heat. 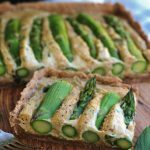 Break bread slices with your fingers into small pieces and transfer them to the skillet. Add salt and black pepper and fry until golden and crispy, about 4 minutes, stirring occasionally. 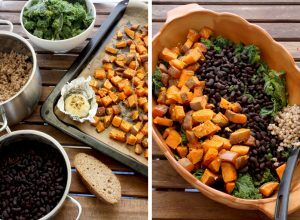 Transfer roasted sweet potatoes, buckwheat, kale and black beans to a backing dish. 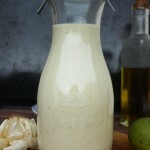 Pour the roasted garlic dressing. 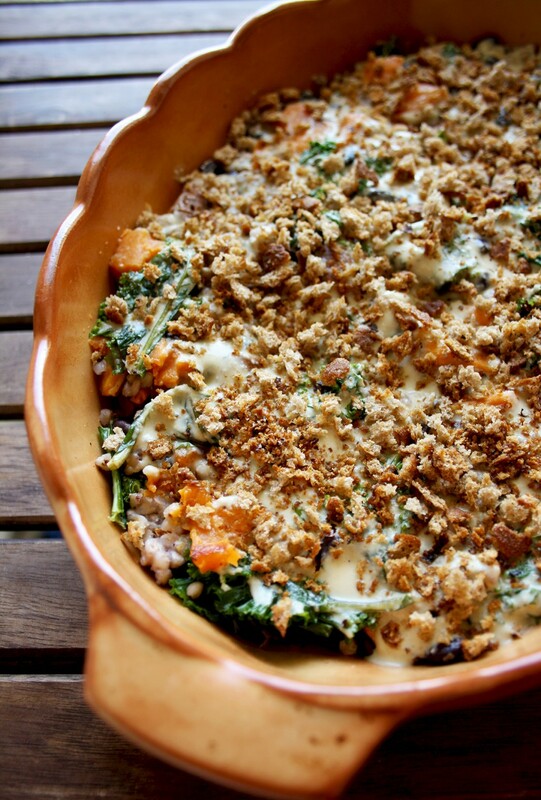 Top with breadcrumbs. Bake for 10 more minutes. Enjoy! 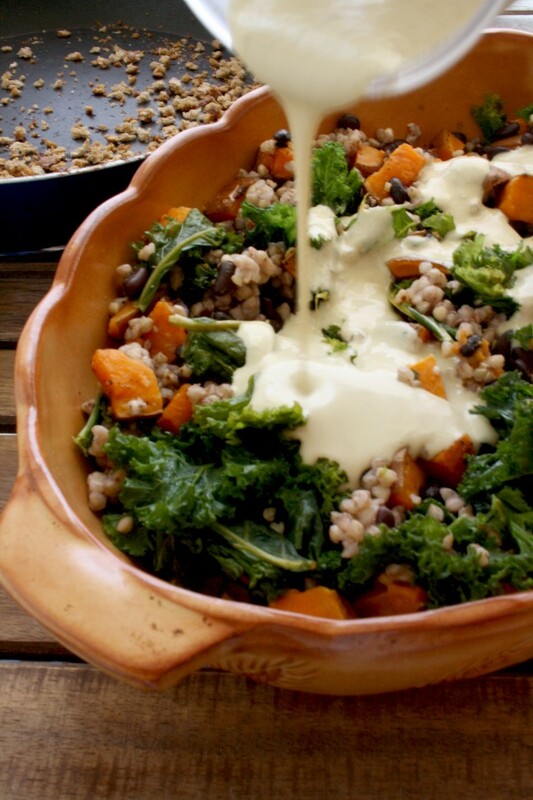 If you pre-roast the sweet potato and cook the buckwheat, it will take you around 15-20 minutes to make the casserole. 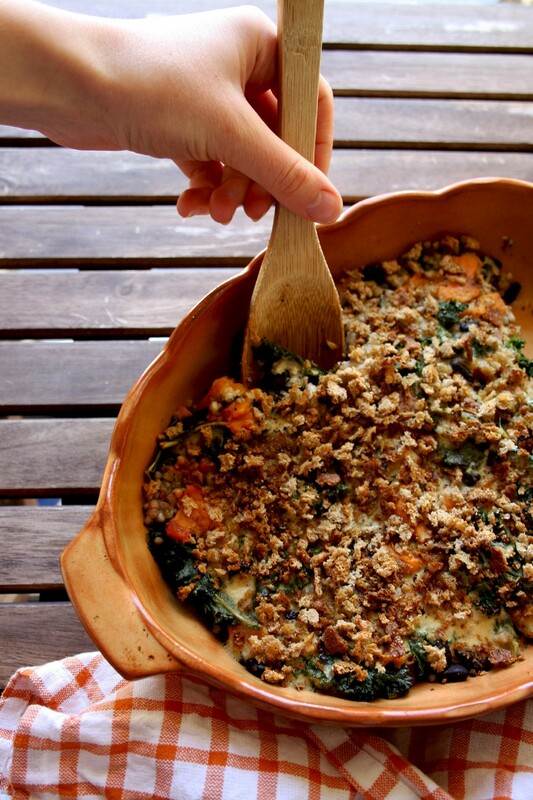 What is your go-to casserole recipe? Leave a comment below! 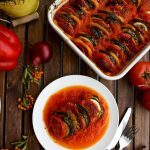 Hi, I’m a writer with Care2.com and I’d love to include a link to this recipe in one of my articles. Would it be alright if I also used one of your photos of the casserole? Thanks! Hi Zoe, sure, you can use it! Looking forward to read your article! Great, thanks Elena! I’ll send you the link once it’s out. Thank you for letting me know, Zoe! What an awesome round up! 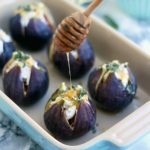 You show roasting the garlic for the sauce with the potato, but where is the recipe for the sauce?